An exclusive BeadifulBABY® Original - Grow-With-Me® designer necklace. This beautiful necklace can be resized - so she can wear her adorable keepsake as she grows. Created to your specifications in our Frisco, Texas, USA location. Necklace shown with round grade AAA 5.5mm - 6mm mauve freshwater cultured pearls. Choose size from baby to adult. Necklace shown is 14" on a five year old child. Shown without two optional gemstones (sizes vary 3.2mm - 4.8mm). Select a gemstone below to add two birthstone gemstones to necklace. Matching mauve pearl bracelet and pearl earrings also available. Step 1. Select Necklace Size. Most babies and toddlers will fall into the necklace guidelines set forth; however, since baby neck sizes vary greatly as do baby birth weights it is always best to measure to ensure you have selected the best necklace size for baby. Step 2. Select Engravable Charm (Optional). Charm will be placed in center of necklace unless otherwise specified in step 6. Step 3. Enter Front Personalization Text. Step 4. Enter Back Personalization. Step 5. Select Font / Monogram Style. Step 6. Specify Engravable Charm Placement. Engraved charm will be placed in center of necklace if placement is not specified. Most popular placements are center or one or two pearls from clasp. Step 8. Add Charm One (Optional). 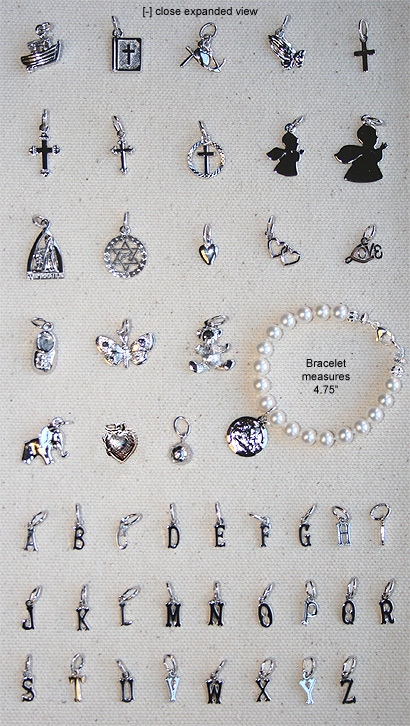 The charms pictured below are perfect for small bracelets. For more options browse the entire charm collection. Charms purchased separately may be added to any bracelet or necklace. Step 9. Add Charm Two (Optional). Step 10. Specify Charm(s) Placement (Optional). Charm(s) will be placed near clasp if placement not specified. Some charms look great as pendants placed in the center of the necklace while others look best near the clasp. Step 11. Select Clasp / Extension Chain Option. EC = Extension Chain. When an extension chain option is selected a 2" long sterling silver chain with a pearl drop is attached to the necklace. The clasp can hook onto any of the extension chain links. Add a gemstone to personalize the drop. Step 13. Add Jewelry Polishing Cloth (Optional).